AUSTIN, TX (July 15, 2015): David Weekley Homes now has two new model homes, The Hennessey and The Glenmeade, open in the Pflugerville community of Blackhawk. 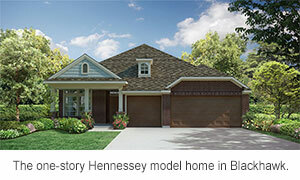 The one-story Hennessey is part of the Lifestyle Series and has 2,318 square feet of living space and features three bedrooms, two full baths, one half bath, study with tray ceiling and outdoor living area. The Glenmeade is a two-story home that’s part of the Executive Series with 3,503 square feet, including four bedrooms, three full baths, one half bath, study, bonus room and outdoor living space with fireplace, grill and refrigerator. PPriced from the $245s, homes in the Lifestyle series are situated on 55-foot homesites and range in size from 1,600-2,900 square feet, while the Executive series is priced from the $310s and features 65-foot homesites and homes ranging in size from 2,400-3,500 square feet. All homes in Blackhawk are EnergySaver™ homes backed by the Environments For Living Platinum level program’s energy and usage guarantee. Community amenities include a multi-million dollar amenity center with three pools, party room with kitchen, playground, fitness area, sand volleyball court, basketball court and baseball field. The area also features 100 acres of green space, along with hiking and biking trails. Blackhawk residents also have close access to Lake Pflugerville for fishing, canoeing and kayaking as well as three miles of trails. Homebuyers can also enjoy nearby shopping at Stone Hill Town Center and La Fronterra Shopping Center. Students attend Pflugerville ISD schools. The model homes are located at 20505 Martin Lane Pflugerville. For more information about Blackhawk, contact 512-821-8803.